The potential difference (PD) measured in volts gives information on the power supplied to the current by the cell. 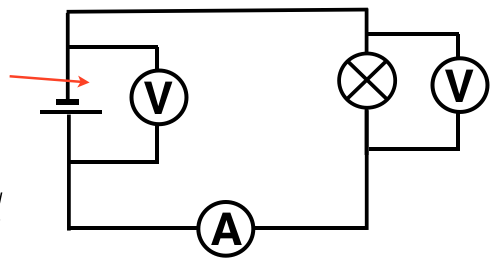 In this case the two values of PD are the same since the only component in the circuit apart from the cell is the lamp. Almost all the energy leaving the cell is transferred to the lamp since only a tiny amount of energy is used to drive the current through the thick copper wires. Some energy will however be changed to heat inside the cell- see internal resistance and EMF.